Form 760F is a Virginia Department of Taxation form also known as the "Underpayment Of Virginia Estimated Tax By Farmers, Fishermen And Merchant Seamen". The latest edition of the form was released in December 1, 2017 and is available for digital filing. 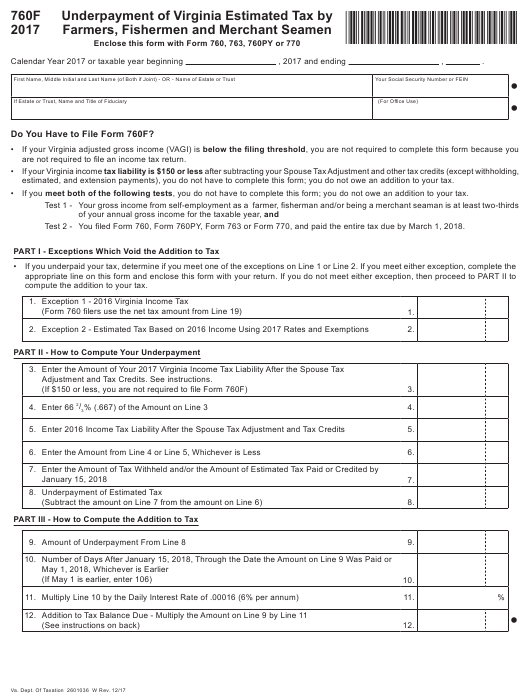 Download a fillable PDF version of the Form 760F down below or find it on Virginia Department of Taxation Forms website. Do You Have to File Form 760F? are not required to file an income tax return. estimated, and extension payments), you do not have to complete this form; you do not owe an addition to your tax. • If you meet both of the following tests, you do not have to complete this form; you do not owe an addition to your tax. Test 2 - You filed Form 760, Form 760PY, Form 763 or Form 770, and paid the entire tax due by March 1, 2018.
compute the addition to your tax. Adjustment and Tax Credits. See instructions. (3) the return was for a period of twelve months. tax rates and personal exemptions. of the credits included on Line 5 and enter the result. on Line 3 is $150 or less. % (.666) of the amount on Line 3. Spouse Tax Adjustment and tax credits. to complete this form; you do not owe an addition to tax. estimated tax paid or credited by January 15, 2018.
you do not owe an addition to tax. on Line 7 from the amount on Line 6.
and paid the entire tax due by March 1, 2018. Line 9. If Line 8 is an underpayment, enter the amount here. If you do not meet Test 1, use Form 760C. interest on the next succeeding business day. due date of your income tax return. Virginia income tax forms at www.tax.virginia.gov. and enter the amount of addition to tax on Line 11 of Form 770.
any amount you may owe on your income tax return.